Kera Island can be seen from the side of Kupang City. To cross to Kera Island you just have to rent a boat residents. Kera Island residents are very friendly to newcomers. Therefore you are advised to bring plenty of meals to share with them. Because the population of Kera Island with a very simple life. Kera Island has a stretch of beach with sand as white as snow. Its beauty can even be seen from across the sea. Beautiful sparkling white sand and invite you to come closer. The waves also calm, so you can play as much on the beach, sunbathing, playing wave or sand, while enjoying the hospitality of Kera Island residents. Kera Island as part of the Marine Natural Park (TWAL; Taman Wisata Alam Laut) Kupang Bay and is located in East Nusa Tenggara. TWAL Kupang Bay is one of the natural park in Indonesia bordered by two administrative regions, namely Kupang regency and Kupang city. If you get on a plane from various regions to Kupang as East Nusa Tenggara provincial capital shortly before landing at El Tari Airport, you can see Kera Island. 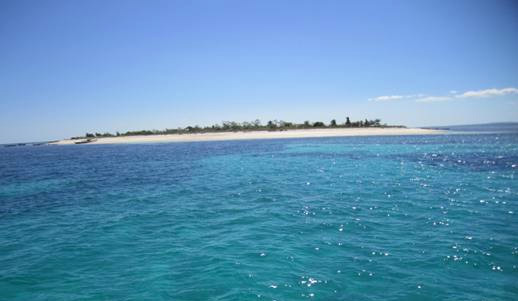 Kupang Bay was designated as one of Indonesia's marine natural park. TWAL wide Kupang Bay is 50,000 ha. Based on Law No. 5 of 1990 on Conservation of Natural Resources and Ecosystem, one of the functions marine natural park is a nature conservation area designated for the holding of the tour. If you are visiting Kupang then direct the natural attractions that you can enjoy is Kupang Bay. Kera Island is a small island in the TWAL Kupang Bay that located between Semau and Timor island, and has a characteristic composed of white sand. Texture of sand on Kera Island is very different from the texture of the sand on Semau and Timor island. Kera Island, in addition to a white sand, also has different types of reef fish, coral reefs, and beautiful sea views are tourist attraction that can be offered to the tourists both locals or foreign. If you want to visit Kera Island, you can use a fishing boat and takes about 1-2 hours depending on the circumstances of the sea.